With just over 5 weeks until Christmas 2015, gift purchasing for loved ones is well under way and our collection of wine decanters will help inspire you for a Christmas gift for a loved one! We have a great selection of different wine decanters and carafes from a host of different renowned manufacturers catering for all budgets, both made by machine and by hand, with decanters starting from as little as £19.95! Our collection of Decanters are from manufacturers such Schott Zwiesel, Riedel, Zalto and Stolzle, so why not treat the wine lover in your life to a brand new wine decanter this Christmas. The Cuvee wine decanter from German based Montana is one of most popular wine decanters for the Christmas period, it’s design has a traditional shape with an angled opened which aids to help pouring. The decanter can take up to 1.5 litres but it’s best to pour 750ml as this will fill the decanter to its widest point. Packaged in a simple yet attractive white pictured box, the Cuvee Wine Decanter is great value for money and we’re sure a recipient of this gift this Christmas will be very pleased! 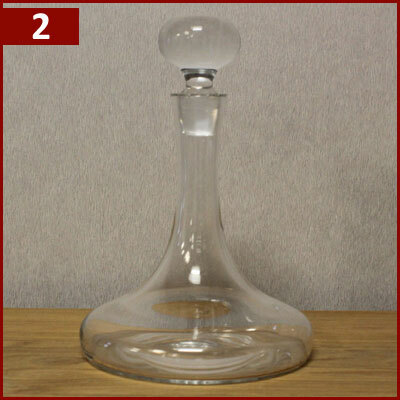 This traditional plain ships decanter has a wide heavy base, long neck and heavy to handle stopper. The decanter and stopper are made entirely by hand, mouth blown from non-lead glass. The included stopper is easy to handle and prevents any dust and unwanted air particles from disturbing the wine between servings. An entire standard bottle (750ml) will fill the decanter to the widest point. 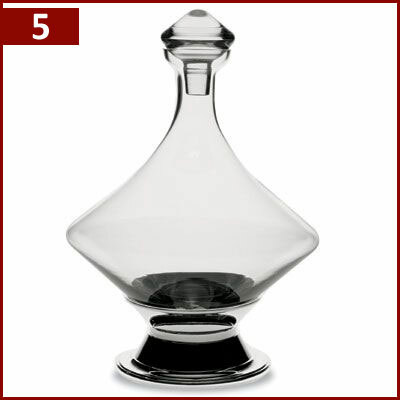 The design makes this decanter stand out when compared to the more modern pieces available. This beautiful crystal wine decanter from Eisch Glas is by far one of our most popular and it’s easy to see why! The lovely wide bowl decanter has a long neck, wide opening and large capacity, it’s easy to get your hand around the bowl to hold so it’s easy to pour into a glass. The rim has a ‘No Drop Effect’ treatment which prevents dribbles of wine from running down the side of the carafe. Made entirely by high quality lead free crystal glass in Bavaria Germany, Eisch Glas pride themselves on their stunning wine decanter! 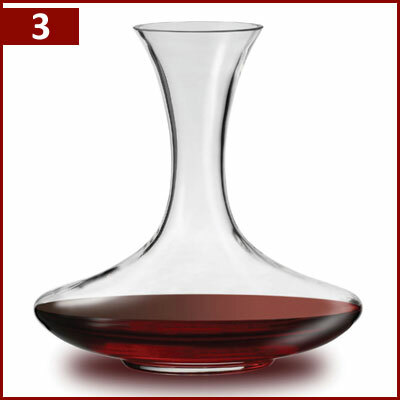 Presented in a nice branded gift box, the Claret Wine Decanter makes for an ideal Christmas gift. The Eisch Glas Chateau wine decanter is also made entirely by hand in Bavaria Germany using high quality lead free crystal glass. This stunning decanter also has a nice wide bowl and large capacity, but this time a slightly longer neck with an angled top/opening, this makes pouring from the decanter to glass a lot easier. With the no drop effect treatment as well, you won’t have dribbles of wine running down the side of the decanter onto the tablecloth! This would be a great gift a keen wine enthusiast who likes to decanter their red wine before. The Turn Wine Decanter is completely different to the other more ‘classic’ / ‘traditional’ wine decanters featured in our Top 5 Decanters for Christmas. This unique wine decanter does have a flat base, but an angled based so it needs to be housed within the included silver plated holder. This decanter is designed to be pushed once on a flat surface in a circle motion, forcing the wine to aerate, speeding up breathing process. 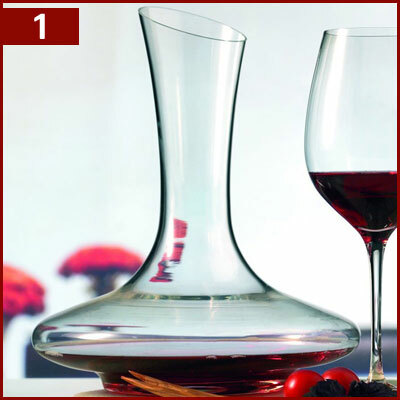 The included top prevents any unwanted air particles entering the decanter and is shaped like the decanter itself. 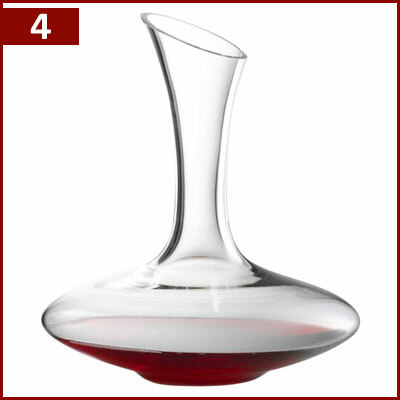 This decanter would be great for a wine lover who likes to thoroughly decant their wine before drinking. If you can’t decide which wine decanter is best for your lucky recipient, why not opt for a Wineware Gift Voucher instead? They can then choose the perfect decanter for themselves! You have until 12 Noon on Tuesday 22nd December to purchase your Wineware Christmas Gift for guaranteed pre-Christmas dispatch!